Side effects, health risks, and a short duration of action limit the usefulness of this drug. Many patients inquire about the use of marijuana for their uncontrolled glaucoma, especially in the setting of increased legalization in many states. In this article, Dr. Graul discusses various limitations of this Schedule I drug for long-term treatment of glaucoma, including its short duration of action, cost, ocular side effects, general health risks, and high potential for abuse. Patients should be counseled and informed about the lack of any scientific evidence demonstrating superiority of cannabis over other currently available pharmaceutical agents for glaucoma that are already approved by the FDA and extensively studied. Since 1971, when it was first reported that smoking marijuana could lower IOP, the plant has attained near mythical status as a miracle drug for glaucoma.1 It is common for patients to ask ophthalmologists about it, and its use for treatment of glaucoma is often promoted by individuals who advocate for marijuana legalization. Figure 1. 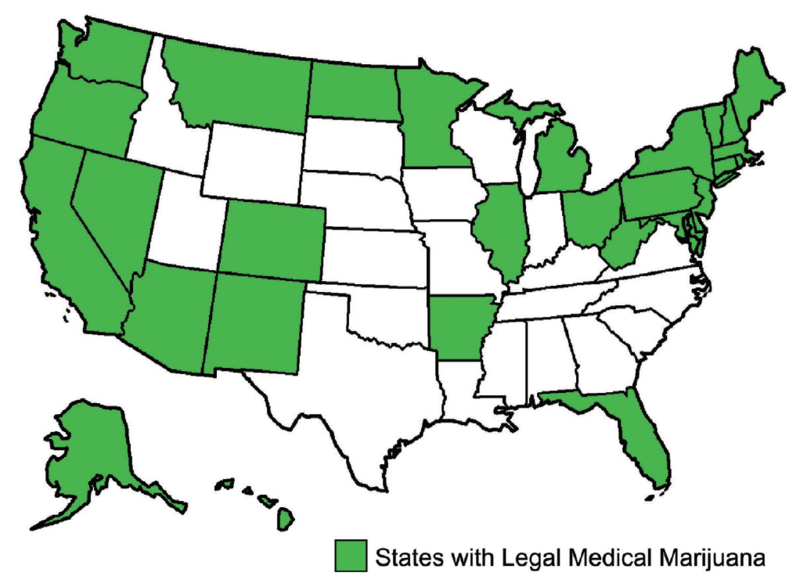 States with legal medical marijuana as of January 1, 2018. Glaucoma patients who inquire about use of marijuana should be counseled that, although the drug does lower IOP, there are many limitations to its use in glaucoma, including short duration of action, variable potency, side effects, development of tolerance, and health risks, particularly when smoked. Compared with marijuana, current glaucoma medications more consistently lower IOP with fewer side effects and a longer duration of action. Patients should be encouraged to continue adherence to prescribed therapy with long-term monitoring of their disease. 1. Hepler RS, Frank IR. Marihuana smoking and intraocular pressure. JAMA 1971;217(10):1392. 2. Zielinski G. Activist Robert C. Randall dies; won right to medical marijuana. Washington Post. June 8, 2001. https://www.washingtonpost.com/archive/local/2001/06/08/activist-robert-c-randall-dies/c6e832a4-55e2-47fc-a3c8-5e011da66e04/?utm_term=.1695285b6ec9. Accessed February 8, 2018. 3. State Medical Marijuana Laws. National Conference of State Legislators. 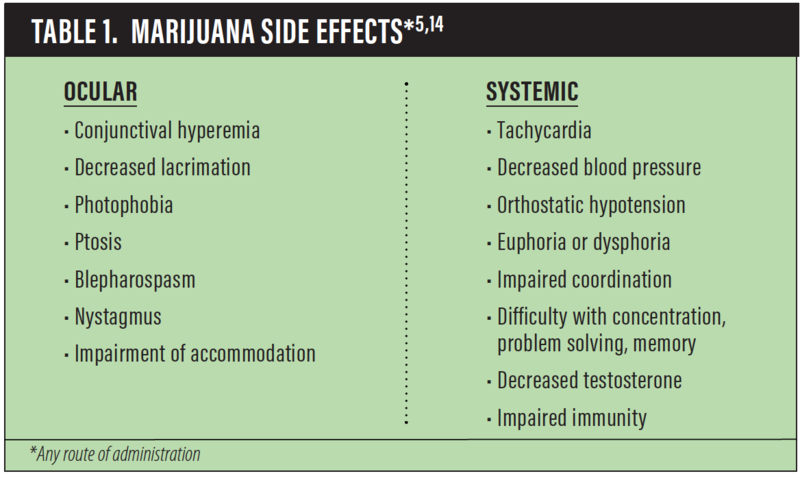 http://www.ncsl.org/research/health/state-medical-marijuana-laws.aspx. Accessed January 14, 2018. 4. US Code: Title 21, Food and Drugs. Chapter 13: Drug Abuse Prevention and Control, Sections 812, 844. http://uscode.house.gov/view.xhtml?path=/prelim@title21/chapter13&edition=prelim. Accessed January 14, 2018. 5. Green K. Marijuana smoking vs cannabinoids for glaucoma therapy. Arch Ophthalmol. 1998;116(11):1433-1437. 6. Tomida I, Azuara-Blanco A, House H, et al. Effect of sublingual application of cannabinoids on intraocular pressure: a pilot study. J Glaucoma. 2006;15(5):349-353. 7. Jay WM, Green K. Multiple-drop study of topically applied 1% delta 9-tetrahydrocannabinol in human eyes. Arch Ophthalmol. 1983;101(4):591-593. 8. Green K, Roth M. Ocular effects of topical administration of delta 9-tetrahydrocannabinol in man. Arch Ophthalmol. 1982;100(2):265-267. 9. Tomida I, Pertwee RG, Azuara-Blanco A. Cannabinoids and glaucoma. Br J Ophthalmol. 2004;88(5):708-713. 10. Zhan GL, Camras CB, Palmberg PF, Toris CB. Effects of marijuana on aqueous humor dynamics in a glaucoma patient. J Glaucoma. 2005;14(2):175-177. 11. Merritt JC, Crawford WJ, Alexander PC, et al. Effect of marihuana on intraocular and blood pressure in glaucoma. Ophthalmology. 1980;87(3):222-228. 12. Kaufman PL. Marijuana and glaucoma. Arch Ophthalmol. 1998;116(11):1512-1513. 13. Jampel H. American glaucoma society position statement: marijuana and the treatment of glaucoma. J Glaucoma. 2010;19(2):75-76. 14. Flach AJ. Delta-9-tetrahydrocannabinol (THC) in the treatment of end-stage open-angle glaucoma. Trans Am Ophthalmol Soc. 2002;100:215-222; discussion 222-224. 15. Novack GD. Cannabinoids for treatment of glaucoma. Curr Opin Ophthalmol. 2016;27(2):146-150. 16. American Academy of Ophthalmology. 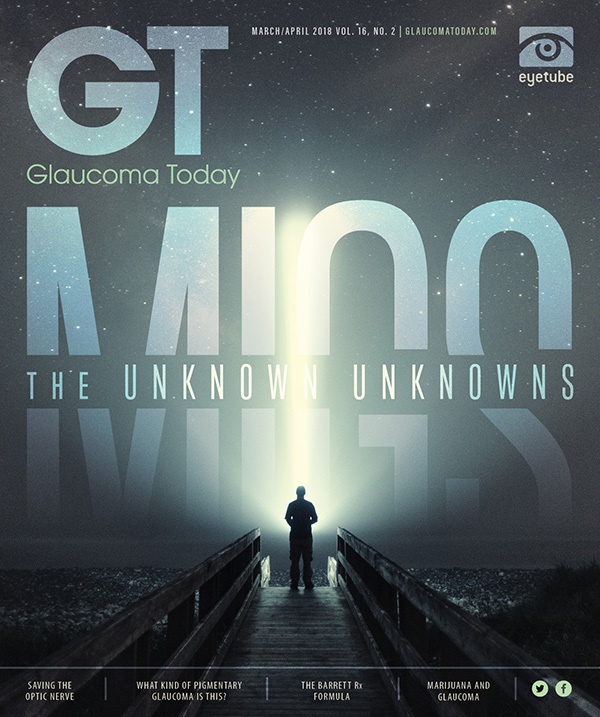 Marijuana in the Treatment of Glaucoma CTA - 2014. https://www.aao.org/complimentary-therapy-assessment/marijuana-in-treatment-of-glaucoma-cta--may-2003. Accessed January 14, 2018.